The Rainforest Cafe at Animal Kingdom is located outside of the park, just past bag check. You do not need a park ticket to go to this restaurant if you are going on your last day or you don't have a ticket for Animal Kingdom. All guests can get there by jumping on a Disney World bus or driving to the Animal Kingdom. If it is open, there is a bag check on the left-hand side which is quieter than the other lines and takes you right to the entrance of the restaurant. The Rainforest Cafe is 1 Table Service Credit on the Disney Dining Plan. I had been to the Rainforest Cafe a good 10 years ago and none of us liked it, so we originally had low expectations of the restaurant. Luckily, we were proved wrong! Check in is located just inside the main entrance in an elephant booth, which I love! Once you have checked in, you are free to roam the shop until your safari party is called. I was sat right next to this little guy, who is in need of a little TLC! Our table was just inside the main entrance in a little corner, which was lovely. I had the view of the aquarium for the whole meal and took great pleasure in watching all the fish swim around! The menu is very varied, with many options. They also have an allergy menu which the chef will come out and explain to those who require it. You are able to have anything on the main menu on the Dining Plan which is great for those who love a big meal! 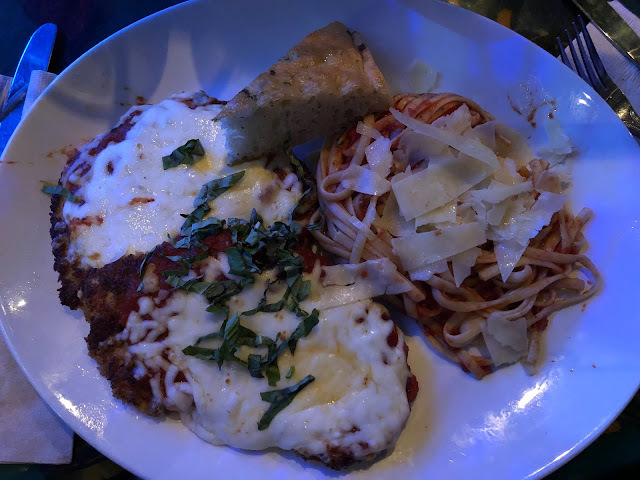 I ordered the chicken parmigana which, in my opinion, is the best one on property. The picture doesn't do it justice of how big it is! There are two huge chicken escalopes, a pile of tagliatelle which shavings of cheese on top and a wedge of garlic bread. It is amazing! The chicken is thin and crispy, with a huge amount of melted cheese and marinara sauce. The garlic bread is great and nice to dip in the sauce. The pasta with the sauce is also delicious! I will always remember the first time I went to Rainforest Cafe and we saw someone order the Volcano and all the servers would shout it out! When our server said that two people can share it on the Dining Plan, I knew what I was having! In true Rainforest Cafe fashion, our server arrived shouting "volcaaaaano!" which had me in fits of giggles. The dessert is huge, as you can see. There are three massive wedges of chocolate brownie, with a mountain of vanilla ice cream and whipped cream, topped with chocolate sauce and a sparkly thing! It is amazing! The brownies are nice and rich and gooey and work well with the ice cream. I shared this with my sister and we didn't even finish it, so I would say this could serve three people easily! Overall, I really enjoyed the experience here. The food is so good with an atmosphere to match. We had a really good time with our server who was fantastic. This restaurant is great for families with little ones, or big kids alike! I'd like to try the one in Disney Springs to see if there is any difference between the two. What has been your favourite experience at the Rainforest Cafe?